Sal Perkins is an American in Panama whose wife is working in a rural area of the country near the Costa Rican border—specifically the Comarca, which is where the Ngäbe, the indigenous people of Panama, live. The man without a shirt lies unconscious at the feet of his friends, who couldn’t care less. They barely notice him as they talk among themselves underneath a big tree in a grassy lot beside Bar Mi Lucha (My Struggle) in the small town of Volcan, Panama, not far from the country’s northern border with Costa Rica. The bar is a big blue structure with two doorways blocked from streetview by chest-high walls. Ironically, a police station sits on the other side of the grassy lot. 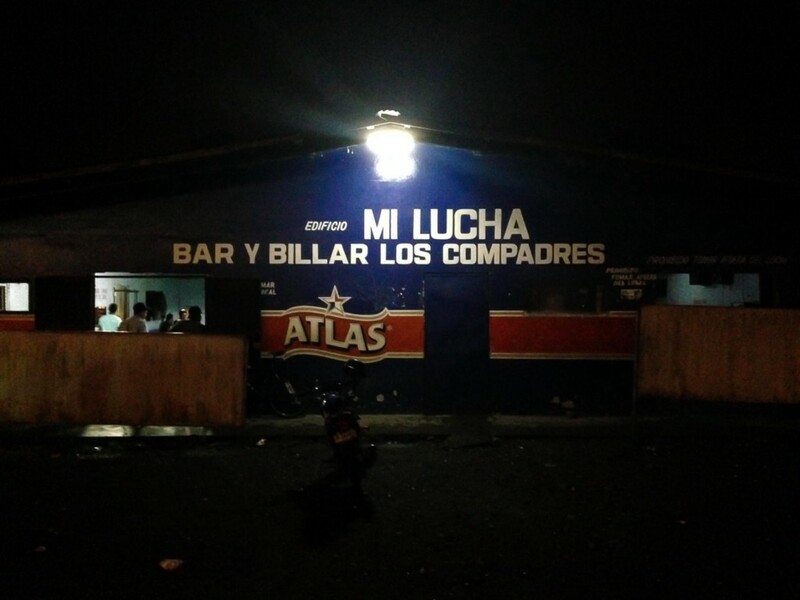 In front of Mi Lucha, another guy buttons up his white cloth shirt, his cheek bleeding — the blood and the beating he just handed out seemingly the key to the affections of a nearby woman in an ankle-length black-and-orange cloth dress of the sort that many female Ngäbe wear. Suddenly, a younger, darker-skinned Ngäbe man stomps out of Mi Lucha. An intricate orange-, black- and green-striped hand-pouch hangs from the waist of his blue cloth pants. He, too, quickly removes his shirt; he’s much more muscular than he looks. A pudgy-faced man follows him out of the bar and strips off his shirt as well; his body is just as poorly defined as it looks. A parade of men and an attractive Ngäbe woman who is smiling and giggling trail behind. “Gordito [Little fat boy],” a drunken old man in tall rubber boots shouts at the pudgy-faced guy. Though the Ngäbe have their own language, land and laws, most are fluent in Spanish and work outside the Comarca. The history between the Ngäbe and the Panamanians is complex, rife with racism and distrust. Many of the problems involve the Cerro Colorado Copper deposit in the Comarca. The Ngäbe have protested the mining that takes place there, and some violence has occurred over the pollution it causes. The Ngäbe battled a hydroelectric dam project in the Comarca for similar environmental reasons. The Chocolatito-Gordito bout continues for another half hour. It’s so grueling and endless that the Ngäbe woman who followed the two of them out of the bar urges Chocolatito to stop fighting. When he refuses, she disappears back into Mi Lucha. Finally, with both Chocolatito and Gordito bloodied and covered in dirt, Chocolatito cannot get up again and his friends carry him back into the bar. As for Chocolatito and Gordito, they eventually make it back out to the lot beside Mi Lucha. Chocolatito has sobered up and is fighting much better. Gordito, however, is still able to knock him down yet again. After which, he stumbles away, too exhausted to fight any longer. Chocolatito gets up for about the thirtieth time and shouts, “Aye!” His friends raise his hands and call him, “El campeón del mundo!” He smiles — victory is his by virtue of having the willpower to get up enough times to make his opponent quit. He hasn’t won a new wife, but he has won the ability to stand with dignity at Mi Lucha.